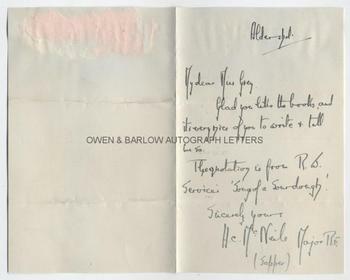 H C McNEILE Autograph Letter Signed. Herman Cyril McNeile, best known by his nom de plume "Sapper". British author. Creator of the character Bulldog Drummond. ALS. 1p. plus integral blank leaf. Aldershot. Not dated but circa 1918. To Miss [Evelyn] Grey. "Glad you like the books and its very nice of you to write and tell me so. The quotation is from R.B. Service's 'Songs of a Sourdough'. Sincerely yours, H C McNeile Major R[oyal] E[ngineers]. (Sapper). 8vo. Approx 7 x 4.5 inches. Slight mounting traces to top edge of verso of integral blank leaf, else fine. Like his famous creation Bulldog Drummond, H C McNeile was a larger than life, flamboyant character. He served with distinction on the Western Front throughout WW1 and fought in both the first and second battles of Ypres and the battle of the Somme. He was mentioned in dispatches and awarded the Military Cross. He rose to command a battalion of the Middlesex Regiment and was promoted to acting Lieutenant Colonel. He wrote several stories during the war which were published in the Daily Mail under the pen name Sapper (as it was forbidden for serving officers to write under their own name). In 1920 he published the first book to feature Bulldog Drummond -one of the enduring creations of popular fiction. Hugely influential, both W.E. 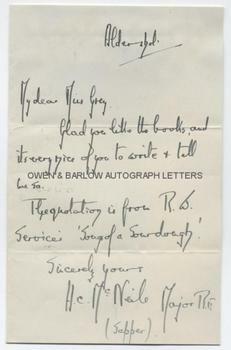 Johns and Ian Fleming acknowledging Bulldog Drummond as the inspiration for their characters Biggles and James Bond. From the album of Miss Evelyn Grey, a young lady who began collecting autographs to pass the time whilst convalescing in hospital during the First World War. 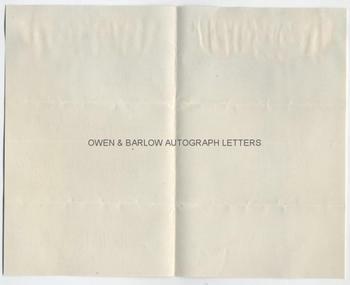 She seems to have had a particular penchant for novelists as many of the autographs in her album are of popular authors of the day.